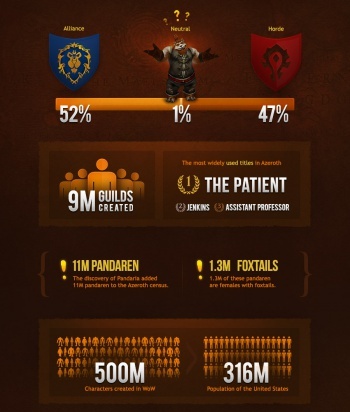 World of Warcraft is obviously popular, but a new infographic reveals that it goes further than that - Azeroth's population surpasses that of most countries. Despite its slow decline in active subscribers, World of Warcraft is a pretty darn healthy MMO. Blizzard released an infographic today to celebrate the crossing of a threshold: since its release ten years ago, a whopping 100 million accounts have been created. That includes trial accounts, mind, but there's no denying it's an impressive census. In fact, it's more than twice the entire population of South Korea, as the infographic happily points out. All in all, Azeroth has a population of about 500 million player characters (an average of five per account, by our math), hailing from 244 countries and territories around the world. 52% of those characters are members of the Alliance, while 47% joined the Horde. Since Pandaren characters start out neutral, there's also 1% of characters who are still on the fence. It just goes to show that the filthy Alliance only wins because of superior numbers. And no, I'm not bitter. World of Warcraft's economy is still booming as well. Every day sees about 2.8 million trades through the Auction House, which was twice the activity of eBay on Cyber Monday a few years ago. All that trade is handled by just 71 auctioneer NPCs in the game world, who each probably deserve a serious raise. You can see the full infographic in all its glory over at Battle.net. There's a lot of big numbers, and they're well-earned; WoW has been more or less the reigning champion of MMOs for a full decade now. Azeroth still has over 7 million active players as of the last report, and something tells me that its community won't be leaving it anytime soon.